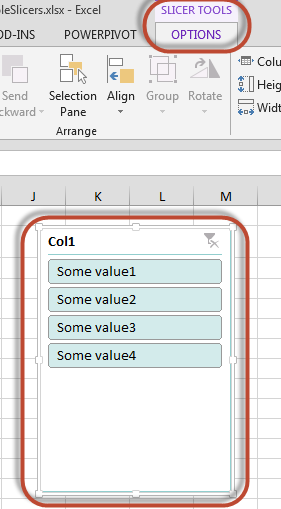 Slicers were introduced in Excel 2010 for PivotTables. What are slicers you ask? If you don’t know, well, you’re in for a treat. Here is some background information to bring you up to speed. So you should know that slicers are an effective way to visually filter your data on a PivotTable, and cue you in to what is now visible and what isn’t. These tools have grown in popularity and are an outstanding improvement to the product. If you noticed, most of those links are dated around late 2010. Why the lull, you may ask? 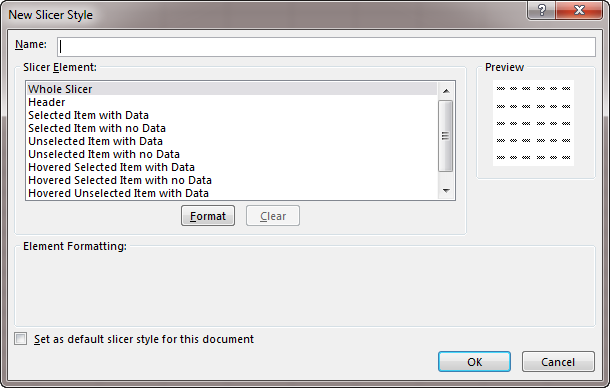 Well, it wasn’t until Excel 2013 that tables received this functionality! As nice as it would have been to have them in the 2010 release, it didn’t quite make it. But now we have the power! If you’re visual like me, you’re going to love these nifty little creatures of data filtering. Let’s walk through where to find them and how to use them. You can find the slicers in two locations. Either on the TABLE TOOLS | DESIGN ribbon tab, which only shows when you have a table part selected, or on the INSERT tab. Nothing very elegant, but it serves as a good example. 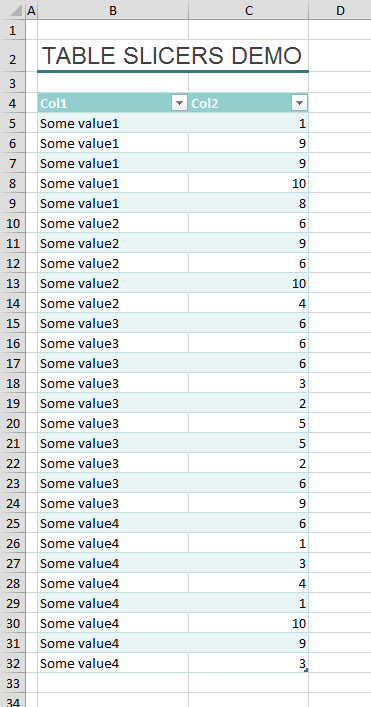 I want to filter ‘Col1’ of the data (pictured above), but with a slicer. That’s it! For this blog post I’ve added a single slicer for ‘Col1’. 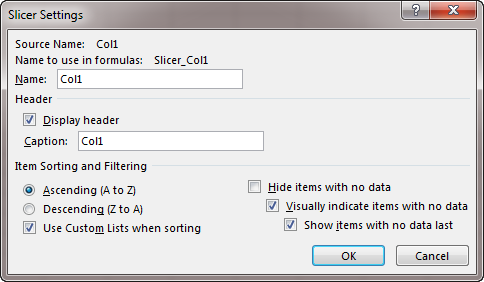 If you select a slicer item you will filter the table (which filters the entire sheet row), as seen below. In here are the same options you have on the ribbon for sizing, as well as the more important Properties section. By default they don’t move or size with cells – which is a good thing. If you had a slicer to the left or right of your table, and the setting was on move and size with cells, then your slicer could go away due to the rows being filtered! As a side note, if you’re creating files for somebody else, think about putting in text into the ALT TEXT portion. This is really important for accessibility options for the visually impaired. Trust me, they use Excel too. Here you can change the Caption of the slicer, which is handy to give a pretty name to it, without having to change your column headers. Most of this is pretty standard, but the ones you’ll want to pay attention to are in the bottom-right corner. Items with no data to show will persist through on your slicers, so if you don’t want to show them you’ll have to check that box. Doing this will gray out the next two options. However, if you don’t check that box, you can choose to visually indicate items with no data. These checkboxes cascade because those underneath are dependent on those above. The one that gets people confused the most is the last checkbox, ‘Show items with no data last’. With this option your unique items will be re-arranged to show those with data first, going from left-to-right, top-to-bottom. If you don’t want them re-arranged, uncheck this box. 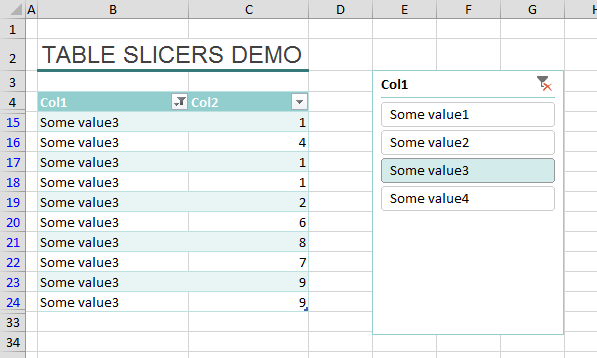 Slicers are a powerful tool and can bring you a rich UI to your Excel files. Not only can you visually see what’s going on with your data, they’re very easy to interact with, and you’ll wow those who haven’t seen them yet. Hi Sean, technically you are right, and technically so am I. 😉 It is the ‘clear filter’ button, and it also selects all items in the slicer, so both are true actually. Thanks for pointing that out! 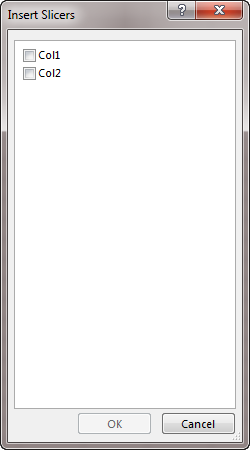 I have developed an xlsm with slicers on a Office 2010 setup. 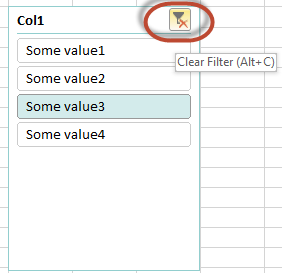 When i load it onto a 2013 machine it seems that the slicers clear the filters and cause chaos with pivot table overlaps. Is this normal, or is it to do with the latest Office updates which has created havoc with ActiveX. Is it possible for a slicer to work on multiple data tables (tables, not pivot tables)? I have 5 tables with many varying columns. But they all have some of the same columns (year, month, facility) and that’s what I want to the slicers to filter. When I try to do ‘report connections’ it’s grayed out. Thank you for your advice. How to arrange the icons inside slicer as i need ?